The resine dial is as demanding to produce as an enamel dial, involving a cutting-edge technique. The first step is to create a three-dimensional mould of the multi-level dial elements including hour and minute markers, numerals, railroad chapter ring, Speake-Marin logo and topping-tool motif, as well as the Spirit title. This mould is used to make a negative mould in which lacquer and Super-LumiNova masks are successively applied, ensuring the right materials and colours are in the correct places. 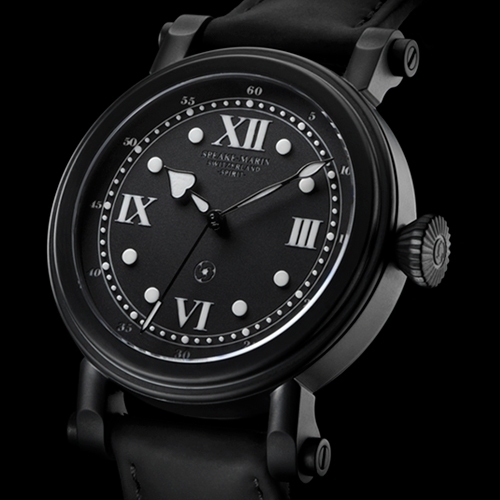 When set, the one-piece dial face is removed from the mould and bonded to a traditional dial plate.